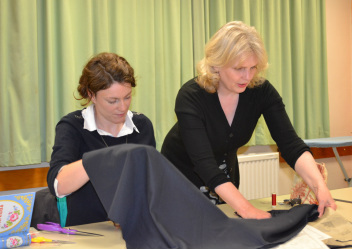 With over 30 years experience of all types of sewing – both practical and creative – I have sewn most things at one time or another; from making wedding dresses, curtains, blinds and children’s clothes to bags. A degree in Textile Design expanded my creative side and developed a love of embroidery. I have a particular love of freemotion machine embroidery and wholeheartedly agree with Kirstie Allsopp when she described it as ‘the crack cocaine of the craft world’! I really enjoy seeing students accomplish their dreams, overcome their trepidation, and take home something that they have made themselves and never thought that they could manage.